“And you can still see the sea!” She wanted to swim there, immediately- she had a childlike urge of excitement at the sight of water so clear the rocks at the foot of the cliffs looked like clumps of turquoise flowers growing on the seabed.” (An excerpt from The Sea Garden by Deborah Lawrenson). My heart warmed up in a similar fashion as I stepped into the Kuang Si National Park. 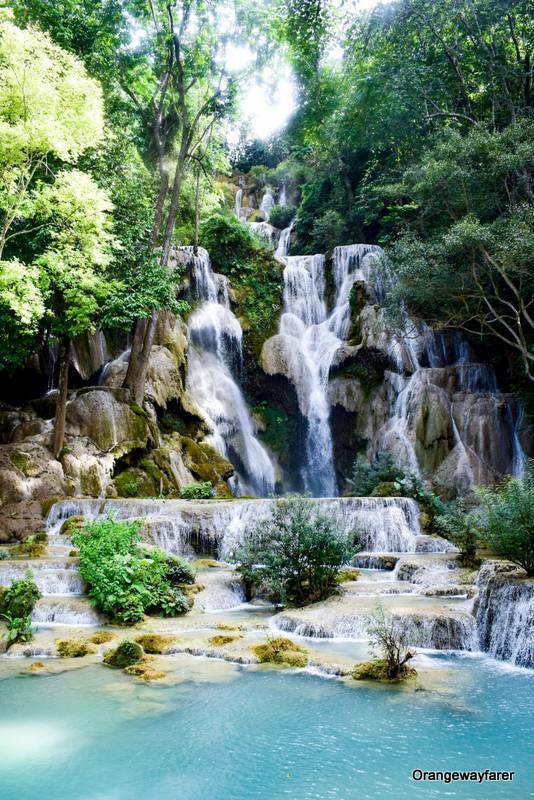 A cascading voluminous and beautiful waterfall, befitting the distance of a quick day trip from Luang Prabang, the UNESCO Heritage Site, Laos. The landlocked country lacks sea beaches but has the mighty Mekong river flowing in his swag! And then there are millions of waterfalls, flowing through the sleeping dragons, often unexplored to the outer world and picturesque in every sense! 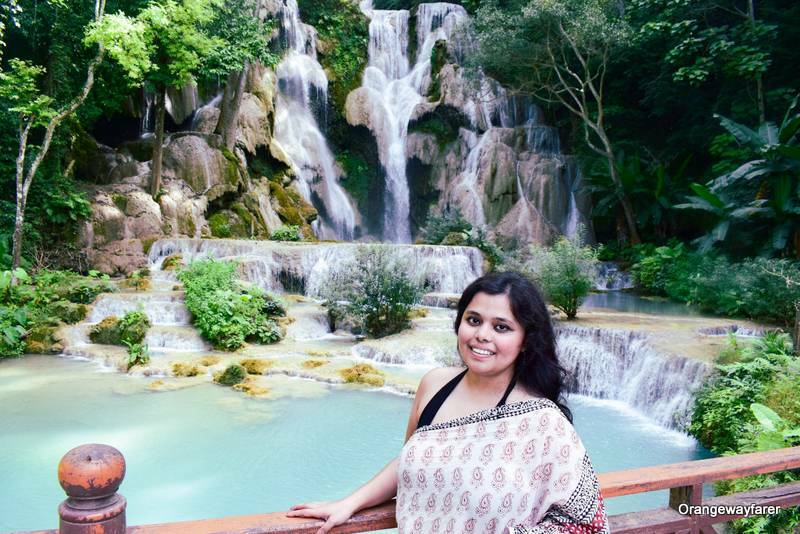 Kuang Si Falls in all her Glory! The plunge is at the top of the three steps. How Far is Too Far: Reaching Kuang Si from the heart of Luang Prabang? Kuang Si is just 30 Km from Luang Prabang local Market. You can hire a tuk-tuk for around $15 for the whole day and make this trip. Alternatively, you can ride a rented scooter and your sweetheart can be the pillion rider! There is a ground where the vehicle can be parked. the road onwards is mildly steep and has sprawling paddy fields on both the sides. Green carpet soothes your mind as monsoon beckons in Indo-China! Pro-tip: Go early morning to avoid the crowd. Pay 20K Kip to enter the falls! I wore a cotton saree. I bought it from Nallis, Bangalore. Because of this saree, I could not hike to the top. I suggest you dress in a way that lets you hike. The park opens at 8 am. 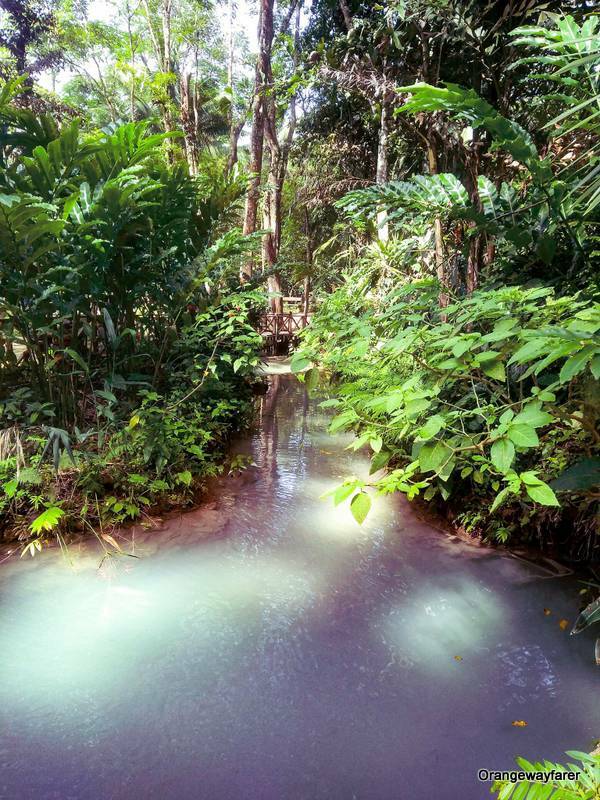 You can ignore other worldly matter and hike the jungle trails to the turquoise-green aqua bodies or make a quick stop on the way to greet the Asian Bears! Say hi to the bears! The blogs that I read earlier, did mention about the Bhaloos in the cage. However, I was under the impression that you need to make a deviation from the regular route. I could not be more mistaken. the bear sanctuary lies right at the foothill of the falls and houses a few Asiatic bear species for a few decades now. Their ancestors have been treated with the vilest example of human greed. The bear Paw soup, a delicacy in Chinese or the bile of a bear that is used in local medicinal practice demanded these animals to be mutilated. Good sense prevailed when the government took the initiative to rehabilitate them with a few swings and wooden home on a bamboo stand. they seem to be used to flashes and other touristy paparazzi and happy to pose with a ball or cast an inquisitive glance while relaxing on the swing made of “Bosta”! Make believe your Camera that you can do it! 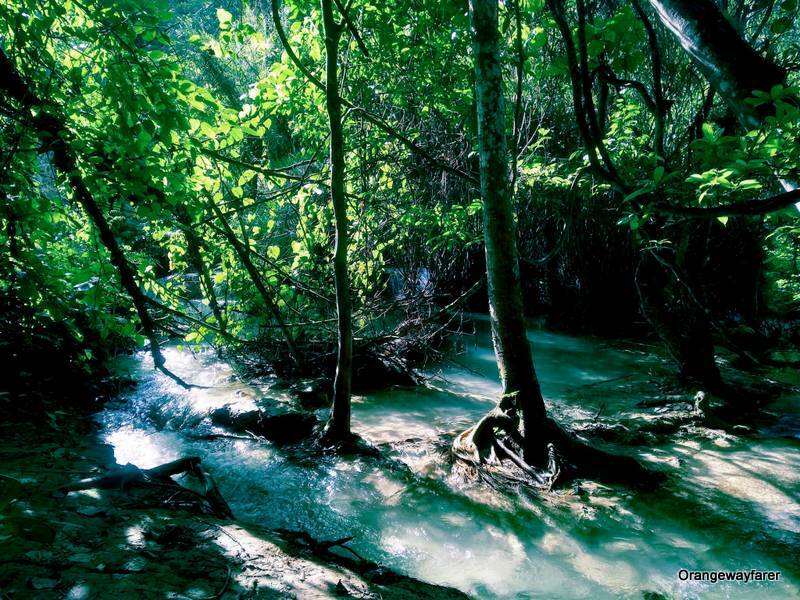 Once the bears have quenched the wildlife spotting drive, you are to head through the muddy, leafy trail that walks towards one of the many pools of Kuang Si! I wonder, what if one day the cage breaks open and the bears decide to take a dip in the pool! Kuang Si falls is essentially a pristine destination where nature decided to show off her sense of art! In a set up that majorly triggers “lost in the woods” feel, Kuang Si is a river system that comes from atop a mountain and rushes to meet the river Mekong! meanwhile, she chooses to create multiple pools in green-turquoise-aqua hues while cascading down. Water gushes through in few spots, making swimming a life risk. Water is still, shallow at certain spots, making it a perfect place to swim and find the coveted pearl! There are mangrove areas where tiny fishes jostle. Put your feet into the water and get a foot-fish-spa done! Also read: A memoir from Laos! If you have attended of the Laotian traditional folklore session, you are acquainted with the romanticism of moonlit night and Laotian flute, Khene. Maybe, long before Indo China became a hotbed of tourist transit, a lover would play his Khene to impress the girl next door, sitting by the banks of this amazing aquatic system! I think I just had Krishna Mythology romantic flashback in the set up of Kuang Si! You can not really blame me. The place is beautiful. There are huge trees reigning over the territory. Their trunks are interlaced with barks from a different time period. They have witnessed history, been reared with multiple generations of local love. They are unabashed. They are real and raw! Also read: Plan the perfect two weeks’ itinerary for Vietnam! Kuang Si will let you take a dip, even dive in the first two plunge pools while the third one stands in all her glory. the plunge is around 60 meter from the top and pastel shades of water soothe your eyes! Most of the tourists will venture in from here but Kuang Si has more for you. proceed to the top of the hill from the muddy staircases and climb atop. The view is good, as usual, just like every hilltop gives you a bird’s eye view! But there is more! The top of the waterfall has a pretty bamboo swing, a still waterbody green with the mangrove shades from the banks, beautiful bamboo walking bridges and not a single soul in close vicinity. The hike to the top comes with a really steep trail, often slippery with a few mountain streams and is ventured by the adventure seekers. I recommend this trail only if you are physically fit! 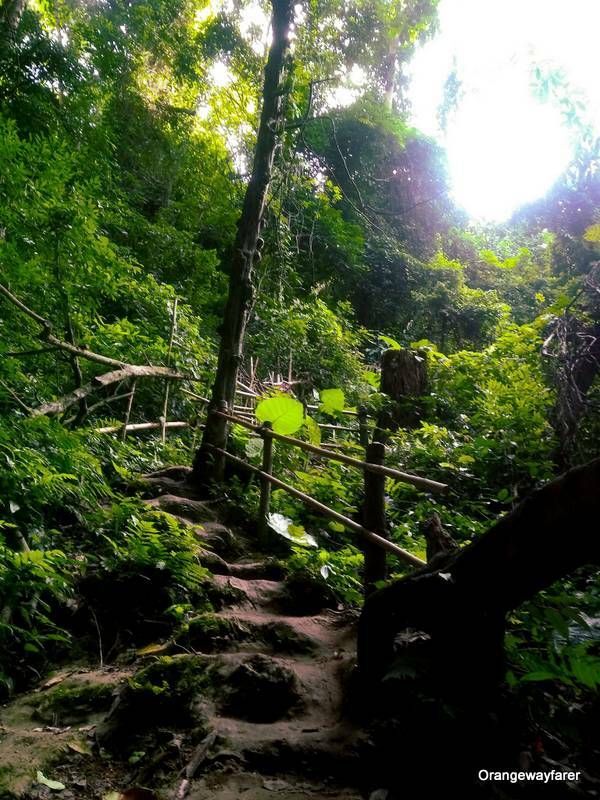 The way up to the top of Kuang Si Falls. 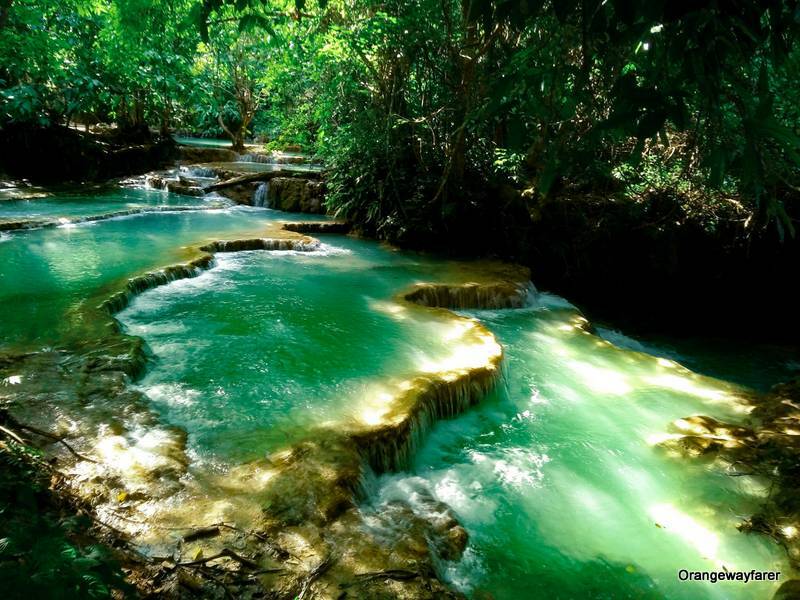 Loved Kuang Si Waterfalls? Protect her! Kuang Si reminded me of Phi Phi island in every way! The watercolor, the beauty of untouched nature, the lush foliage by the banks, an intangible sense of joy and every good thing that astounding nature offers, filled my mind! But then, Kuang Si has not reached the tourist saturation that Phi Phi has attained, thanks to Hollywood movies and more. Kuang Si remains a beautiful place and needs a conscious endeavor to remain so! Respect for local culture is a prerequisite. I have seen women in Bikini, burkini and normal tees taking a dip in the pool. Clearly, they have opened up from “no bikini” signboards that older blog posts show. Please do not carry plastic. If you do, make sure you bring them back. The washroom and waste baggage in the area are made of bamboo. If you are heading during monsoon, the water flow will be stronger, making swimming a real challenge and stripping it off the turquoise-green identity! Book your next stay in Luang Prabang, Laos! Wow so beautiful..Loved all the pics. Thanks for sharing the details. Wow! Kuang Si looks like a magical water kingdom. And the water is such a lovely shade of turquoise. I’m tempted to take a dip! These turquoise pools are amazing! 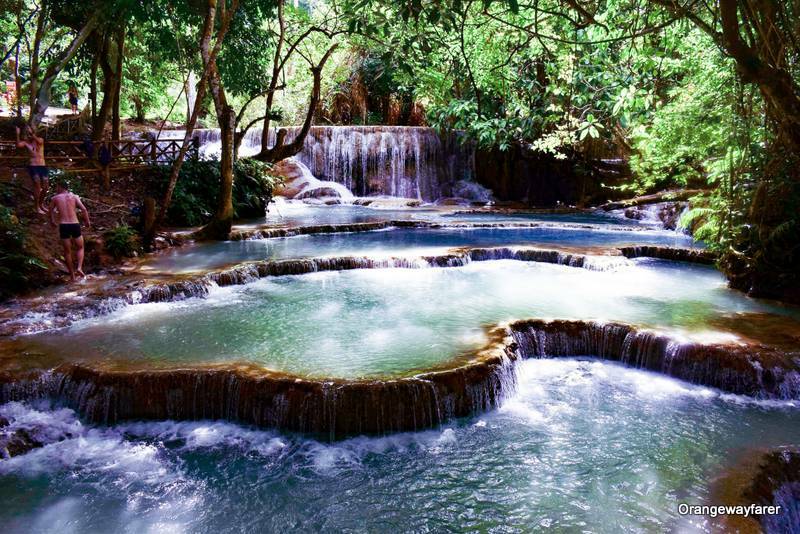 They are quite similar to the pools in Erawan National Park in Thailand. Must be the same process creating them.